Toaster, crockery, cutlery and cooking utensils. Superbly positioned on the 7th fairway, Birkdale Villa enjoys commanding views of the beautifully manicured Highlands Reserve Golf Club. The lounge is a comfortable and welcoming entrance to this hoiday home. Comfortable sofas combined with an entertainment centre will ensure that the living room is the heart of the home. The large master suite, furnished with a king size bed and matching pieces is an extremely comfortable and indulgent room. 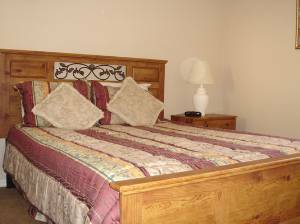 Bedroom 2, located on the ground floor (providing easy access for less able guests) is furnished with a queen sized bedroom set and generous wardrobe space. 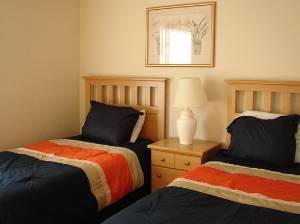 Bedroom 5 is a comfortably appointed twin bedroom with ample warbrobe space. It also benefits from shared access to the house bathroom. 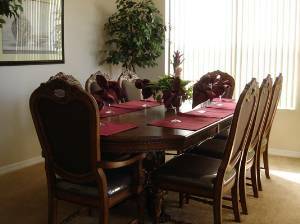 The dining room is an elegantly appointed entertaining area with seating for 8 people. Our ten day stay at the Birkdalevilla was awesome! 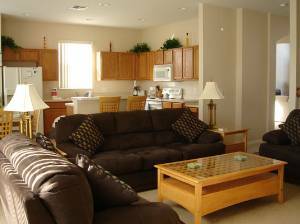 Every room in the home appeared to be designed just for our comfort. We thoroughly enjoyed the way the spacious rooms flowed for family time as well as private time. We spend most of our evenings in the kitchen/den and pool area of the home, and we absolutely loved the oversized patio area with the huge pool and hot tub. There were plenty of fresh linens and towels, as well as a completely equipped kitchen. 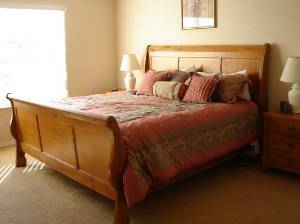 We have been vacationing in Orlando for a few years and have had issues with the bed mattresses being thin and lumpy, however the mattresses on all beds were top of the line, which enabled the busy days to be tolerated much more easily. My grandchildren enjoyed the game room, and rode bicycles throughout the quaint neighborhood in the evening. The neighborhood is not only safe, but the neighbors are all very polite and welcoming. My family and I are all in agreement that Birkdalevilla is the perfect vacation home for us! "We had a wonderful family holiday in Orlando, which was enhanced by our stay at Birkdale Villa. The facilities were excellent, with everything you could ask for and the needs of a wide age group catered for. The environment is lovely, with great views of the golf course to enjoy, whilst relaxing by the pool". Thank you so much for the opportunity to rent your home. We all enjoyed it very much. It was equipped with everything that anyone would need and more. We were so comfortable there and hope to be back in the future. Birkdale Villa is spacious and luxurious. It offers the highest quality accommodation within easy reach of restaurants, shops and theme parks. It offers the opportunity to have relaxing days around the pool and yet is within easy reach of Florida's "must do" attractions. The furniture, fixtures and fittings make this a place you will want to return to again and again. This is a fantastic spacious extremley well equipped house with everything for the family to enjoy, the wireless internet is great for keeping in contact, great heated pool overlooking the golf course, brilliant games room. It is a great location near to highway 27 and I4, so great for access to parks and the Gulf coast, shopping is easy with a Publix and Walmart close by. Would highly recommend. Ist Class. I have no hesitation in endorsing your lovely villa. The villa itself was spotless the pictures on the website if anything do not give the villa total justice as it is very impressive, with all the amenities we were expecting from your website. In particular we have a 13 year old son who found his “den” with the playstation 2 and games room a massive hit. We have found that we also have a potential ping pong champion on our hands. Highlands Reserve itself was a winner for us. This is the 3rd time we have been to the Orlando area, but the first time we have stopped in the Davenport (previously Kissimee) area, the parks are easily accessible and really straight forward approx 15-20 minutes for Disney parks add another 10 minutes for SeaWorld/ Universal. Restaurants are easily accessible on the US192 only 5 minutes or so from the villa, but. Our favourite thing was the location itself Highlands Reserve, tree lined on its entrance and remained a far prettier resort than other developments due to the fact that it surrounds a golf course. The golf course itself is very well run and is a test for any mid/ high handicapper such as my son, I am a low handicapper and the fact that we are bordering the Champions Gate courses was a real plus as I managed to get a game easily even though I was a single player. Overall I would not hesitate in recommending the villa or the resort and if your prospective client would like to email me any questions I would be more than happy to respond. 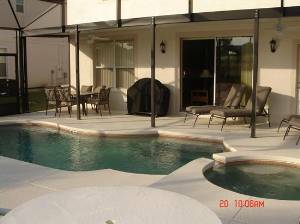 We had a wonderful stay in Orlando and for those seeking a high standard of accomodation and surroundings this villa ticks all the boxes. There were 12 of us all together and the facilities were more than able to cope with such a vast amount of people. The house is decorated and furnished to a high standard with all the facilities you would expect of a holiday villa. We have been to Florida on three occasions now and this is by far the best house we have stayed in. Its location is fantastic, about 20mins to the disney parks, ideal for shopping and if you want a slightly relaxing day you can stay by the beautiful pool or have a round of golf. We are planning to go back in 2011 and will definitely be submitting our booking shortly as I wouldn't want to go anywhere else now! We stayed at Birkdale Villa in late Aug early Sep 2008. We were there with another family who also had two children aged 1 and 3. 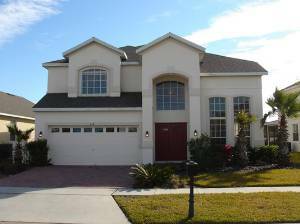 Having never rented a villa before only hotel rooms in the Disney area we were apprehensive to say the least and we took at least 6 weeks to look at probably every villa in the Orlando area. Carol however was very accommodating and answered every question we had and more. The accommodation was excellent trust me my wife is very fussy and this villa passed with flying colours. Travelling to the villa and getting into it was also very easy. Our friends had never been to Florida before and could not get over the standard of this property. It is simply huge even with 4 adults and four children we were able to have our own space and I think there was probably at least one bedroom we never even went into. The children loved exploring the house and playing games around it. As far as families are concerned this property has everything you need. The pool was great (safety net around pool to protect children was a good touch) as was the Jacuzzi and the BBQ was used almost every day. Highlands Reserve itself is a well presented area quite and safe. It is only 15-20 minutes from downtown Disney with a shopping market 2 min drive and a huge Wall Mart only 5 min away. Everything you need is very close. Carol thanks again we will be coming back in 2010..
As we start our last full day here in Florida I thought I would just send you a quick email of thanks. 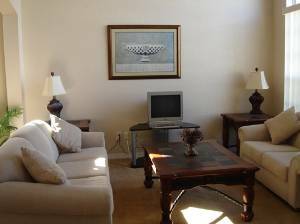 even more enjoyable by the quality and facilities of your lovely property. The internet pictures do not do it the justice it deserves. You seem to have thought of every eventuality, you must have put a lot of effort and thought into this. villa to all of my friends and family. I would be more than happy to provide any potential renters with information and or recommendations.